This sign hangs in my little make-shift office that is in reality just a corner of my dining room blocked off by bookcases and a paneled screen. I often look at this sign as a reminder that I need to take care of myself SO that I can take care of others. “Put on your own oxygen mask first”. But today I am wondering to myself if I use this as a justifier. How do we know if we are really pouring into others? I get up at around 5:45am and have my quiet time with God. I eat some zucchini bread with some coffee while reading and journaling out my prayers. I do my p90X workout at 7am, then clean the kitchen until about 8, then work on some marketing projects for our family business. Around 9:30 I step out of my little oasis, my safe-haven of a home, and rush off to the Kroc Center to teach my weekly PiYo class. On the way I see people. I see a man sleeping on the sidewalk near a gas station, a tarp covering him. I see women walking with their children all bundled up, trying to catch the bus on this blustery cold day. I see men with cardboard signs making their way to the busy intersections near the highway, trying to gain the sympathy of passer-bys. I teach the class to about 8 participants and we have a great workout and prayer time after; specific prayer is requested for our neighborhoods that are riddled with gang violence. After that, I drive home, get out of the car, and I see my neighbor. I yell his name and he immediately turns directions to come towards me. (I’ll call him Leo, but it’s not his real name.) Leo lives in a little house across the street from me– lived there for a long time. Leo is about 45 years old, but he looks over 60. Leo is dying of lung cancer. He’s completely drunk, as usual, but I stand with him by the curb and listen to him talk for a good half hour, making sure he’s not in the street when cars drive by. I don’t really know what to say or how to help him and it makes me feel helpless. His mind wanders, and he keeps talking, but I’m not sure about what. The alcohol is making him slurr his words and the man has only a few teeth left, so it’s hard to understand him. I recognize the hurt in his voice. I have no idea what he’s going through right now– to know that he’s dying and to know that he could have prevented it–but I can imagine. I can imagine and it brings tears to my eyes. He tells me they will take him to the hospital soon, but until then he keeps staying with friends and family because he doesn’t want to stop breathing in his sleep and lay alone in his house until someone finds him. He wants to be found by friends. This is where I start to cry. He reflects on his children. His wife. He hopes he can kiss her again in heaven. He tells me in one breath that he is so angry at himself for doing this to himself, and then in the next that he has no regrets and that he’s happier than he could hope to be. He smells like cigarettes and liquor, and I wonder if he will remember this conversation. I hope he will remember the hug, the warm smile in the bitter cold wind, the patience with which I try to listen to him. I hope… I wish he would surrender this habit of cigarettes and booze. I wish he would try to live out the rest of his short life in sober consciousness, with intentionality and dignity. I wish he knew something other than drunkenness and a chemical high. I wish I could encourage him to change now, to let him know that it’s never too late… but… it is too late, isn’t it? He’s going to die. Soon. What would I do? Would I change? If there no hope for a future improved by my choices? Would I even try? Lord, please give me the words you would have me speak. Lord, please show me what I should do. Lord, work through me so that I can help this man. What the heck? God, why can’t you use me here? I’m right with him! I can do something, can’t I? But God didn’t have anything else for me to do. There was nothing of myself that I could pour into Leo. There was nothing I could change in him. There was nothing I could say to make it better. My cup, regardless of whether it was full or not, was seemingly not pouring into any of the people around me who seemed so desperately to need filling. And even now I ask myself, why? Why couldn’t I have helped? Why couldn’t I have done something? I think the answer is a little more simpler than I usually like: I am incapable. I don’t really know if Leo simply needed someone to talk to, or if there was something that he needed to hear in that moment. All I know is that I didn’t do any “pouring into”. All I did was listen to him speak, simultaneously listening to the quiet sound of my heart breaking. I go inside my warm home with quaint decor and a clean kitchen, with two cats sleeping on the chairs and reminders to “do all things with love” on the walls. I feel utterly guilty for having what I have, living how I live, and owning what I own. I only hate my own privilege when I can’t seem to use it to help someone who doesn’t have it. My cup– if we’re going with this whole metaphor thing still– feels completely drained dry after my interaction with Leo. I’m emotionally exhausted, guilt-stricken, and heartbroken for my neighbor, and for this community at large. 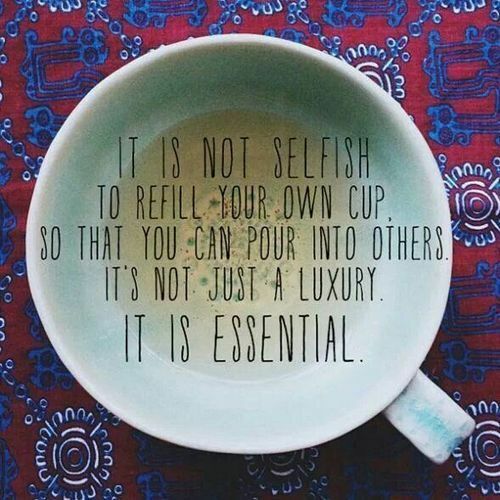 But to refill my cup would, in fact, seem selfish–like a luxury. In fact, most of what I did today– the quiet time, breakfast, workout, job, cleaning, and marketing work– it all seems like luxury compared to what I see when I look outside at this dark and hopeless part of the city that I’ve now been calling home for the past 3 years of my life. –I’ve been told to do this, but it doesn’t seem right. Not when people are sleeping on sidewalks and sleeping at friend’s houses because they might die in their sleep. No it doesn’t seem right when there are people in need everywhere and when it’s really hard to know if helping is helping or if helping is hurting… a lot of things seems pointless and stupid when looking at the heartbreak that surrounds me. This world isn’t fair. I believe that this outrages God more than it could even outrage us. And I believe that God loves Leo and the homeless man at the gas station and the bundled up mommas and their little sweet babies and the men standing at the intersections with signs. He also loves the drivers who pass them by and the ones who roll down their window to toss them some change. He even loves the helpless white girl who doesn’t know what to say to a dying man. This world is dark, riddled with guilt, and it’s so sad. But the beautiful thing is that God’s cup never runs dry, and he continues to pour it out in the form of Christ’s blood. It doesn’t always look like I think it should look, at least not on this broken side of eternity. I do too Leo. I believe it will be a time and a place where all of our cups will runneth over.